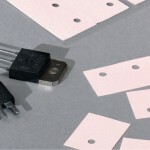 Keratherm Pink exhibits outstanding thermal conductivity which is achieved by a special filled silicone elastomer. The good electrical insulation properties are thereby retained. On request, these films can also be supplied with fiberglass reinforceement and with or without adhesive coating. The excellent thermal resistance of this film achieves the optimum heat transfer to the heat sink. Click to Get a Quote for Keratherm Pink 86/50!